Our journey has been begunway back in 1998, when there was no one available to guide the students of higher mathematics because math was considered as a taboo and subject of genius only. Our student’s positive feedbacks and encouraging results has motivated us to lay down the foundation stone of DIPS ACADEMY in 2004 which is an educational wing of Dubey's Information Pool and Solutions (DIPS) Pvt. Ltd. Since Then, till now, we are fulfilling the commitment made to them by providing the best-possible Doubt-based learning methodology, well researched material and video lectures. 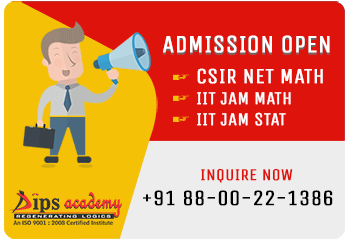 Our exclusivity in Mathematics and Statistics makes us unique in approach for all higher level competitive examinations like CSIR-NET, GATE, IIT JAM, Civil Services, MCA etc. Ever since it was founded, DIPS ACADEMY has been growing at a breath- taking pace. Over the last 19 years DIPS students are achieving a new height in all kinds of research institutes and other high profile jobs. It is India's largest result producing organization for higher level exams like NET and GATE. NAME any IIT or research institute like TIFR, IIMs, IISc, ISI, you can find our students in a heap there getting success with flying colours! Also, apart from it, DIPS Academy has given good results in very high profile jobs like IAS and State PCS.